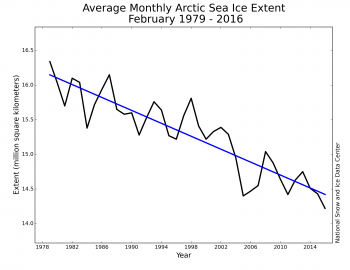 What is happening in the Arctic now is unprecedented & possibly catastrophic. 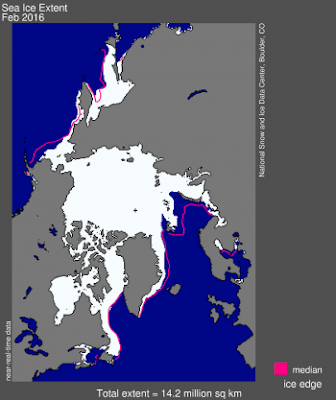 "What is happening in the Arctic now is unprecedented & possibly catastrophic." That is from a world-known scientist, Dr. Peter Gleick, who is a member of the US National Academy of Science, a MacArthur Fellow, and President of the Pacific Institute. This is not a "national crisis". This is a threat to life on this planet as we know it. I won't stop talking about it until we, and our leaders, start to realize how severe it is. Do you think climate silence is a conspiracy by a few major media corporations - or is it possible that all of us are so addicted to fossil fuels, we really don't want to know? To be honest, I can barely bring myself to read the latest news. Maybe the problems in the Arctic are just too big to comprehend, or just too scary to face? Is it worthwhile to keep fighting, if all we can do is slow down the loss - and the damage, for the next generation? There is, says Gleick, a big difference between a civilization facing severe challenges as the Earth warms, and a planet where climate changes so far and so fast that civilization cannot cope or adapt. We'll have to make major efforts to adapt to what we have already done. We can't continue to make it worse. Let's say Greenland ice loss doubles or triples, and the Arctic sea ice disappears for most of the year. Gleick agrees nobody knows what would happen. When we change the greenhouse gases in the atmosphere, we are running a giant experiment on the Earth. It's already out of control. January Arctic sea ice extent was the lowest in the satellite record, attended by unusually high air temperatures over the Arctic Ocean. January 2016 was a remarkably warm month. Air temperatures were more than 6 degrees Celsius (13 degrees Fahrenheit) above average across most of the Arctic Ocean. The Arctic is absorbing a lot more solar energy, and at a much greater rate, than anywhere else on the planet. In the last number of decades, the Arctic temperature has risen 1.0C per decade whereas the global average temperature rise has been about 0.15C per decade. 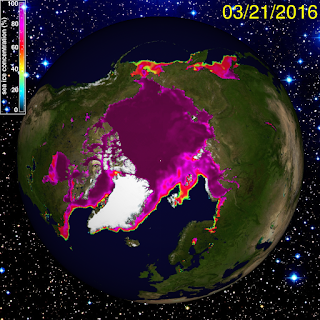 Arctic sea ice extent for February averaged 14.22 million square kilometers (5.48 million square miles), the lowest February extent in the satellite record. It is 1.16 million square kilometers (448,000 square miles) below the 1981 to 2010 long-term average of 15.4 million square kilometers (5.94 million square miles) and is 200,000 square kilometers (77,000 square miles) below the previous record low for the month recorded in 2005. 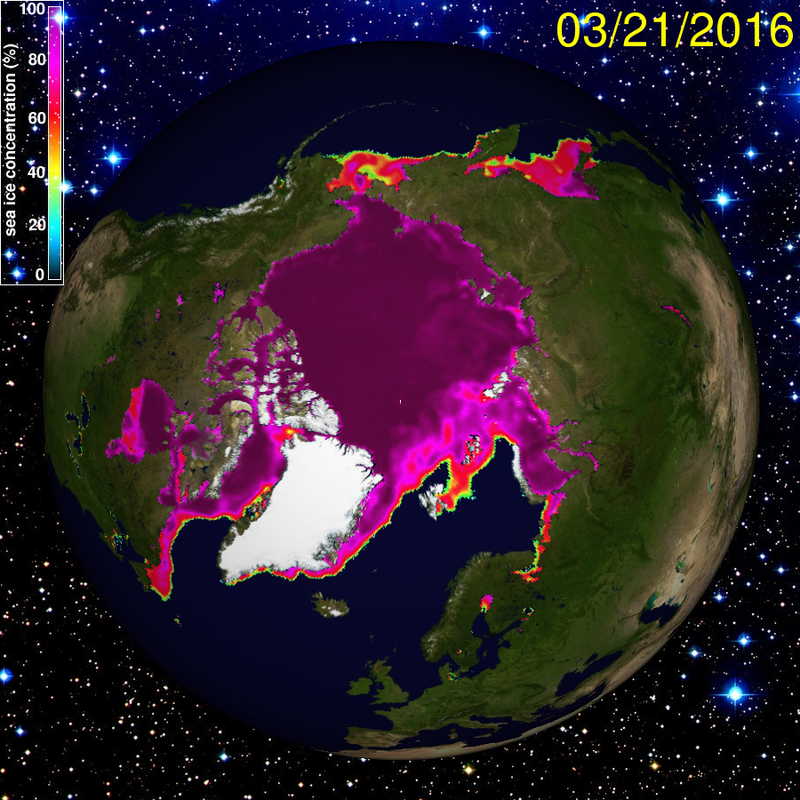 The first three weeks of February saw little ice growth, but extent rose during the last week of the month primarily due to growth in the Sea of Okhotsk (180,000 square kilometers or 70,000 square miles) and to a lesser extent in Baffin Bay (35,000 square kilometers or 13,500 square miles). Extent is presently below average in the Barents and Kara seas, as well as the Bering Sea and the East Greenland Sea. Extent decreased in the Barents and East Greenland seas during the month of February. In other regions, such as the Sea of Okhotsk, Baffin Bay, and the Labrador Sea, ice conditions are near average to slightly above average for this time of year. An exception is the Gulf of St. Lawrence, which remains largely ice free. Cryosphere climate change is not like air or water pollution, where the impacts remain local and when addressed, allow ecosystems largely to recover. Cryosphere climate change, driven by the physical laws of water’s response to the freezing point, is different. Slow to manifest itself, once triggered it inevitably forces the Earth’s climate system into a new state, one that most scientists believe has not existed for 35–50 million years. Adaptation to the levels of projected climate-related disruption, particularly sea-level rise that cannot be halted and accelerates over the centuries, simply will not be possible without massive migration and other changes to human centers of population and infrastructure, that will carry enormous economic and not least, historic and cultural costs. The only way fully to avoid these risks is never to let temperatures rise into these risk zones. After the climate is broken, and the cryosphere starts it's unstoppable melt, there is no way to "fix" it. Basically: humans will have to leave their coastal cities behind, and the some of the most fertile near-ocean river estuaries that now support many millions of people. "Policy makers and the general public alike now largely accept that the Arctic, Antarctica and many mountain regions already have warmed two-three times faster than the rest of the planet. What is less understood, outside the scientific community, is that the very nature of the cryosphere – regions of snow and ice – carries dynamics that once triggered, in some cases cannot be reversed, even with a return to lower temperatures or CO2 levels." “The scary conclusion is that the East Siberian Arctic Shelf (ESAS) alone holds up to 1700 Gt of methane in the form of methane hydrates and free gas in shallow water, of which 50 Gt is ready for release at any time. The warning signs keep getting stronger,” For comparison purposes, there is currently 5 Gt of methane in the atmosphere. An abrupt release of 50 Gt would be very, very, bad! This is the nightmare scenario that keep scientists up at night.